Wintery trick fountains, the Hellbrunn Christmas Angel, a Krampus to touch and much more. 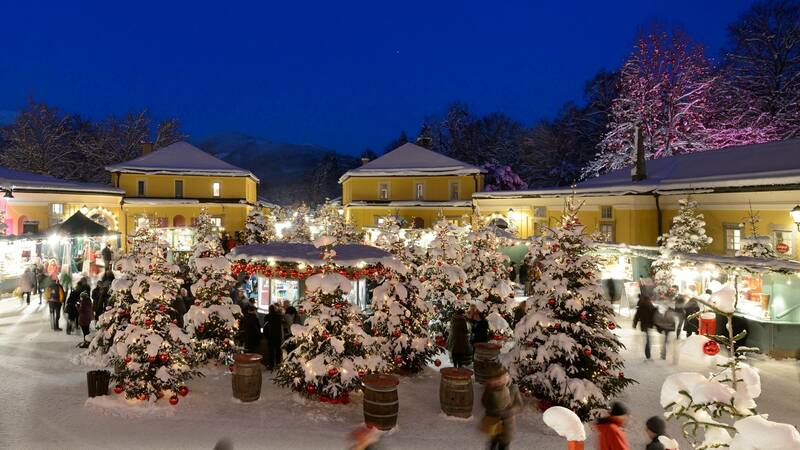 The Hellbrunn Advent Magic has been taking place at the Hellbrunn Palace for more than 15 years and is a pre-Christmassy adventure for the entire family. Already from mid-November there is a fairy forest consisting of more than 400 conifers, decorated with 13,000 red Christmas baubles and fairy lights, which allow the entire area to shine in a very special light as soon as the night falls. A great number of traditional Advent huts, romantically hidden between the green trees, make the time waiting for the Christ Child pass more quickly. A unique ambience and a festive setting that can't be found anywhere else. Saturday from 4 p.m. to 6 p.m. & Sunday from 2 p.m. to 6 p.m.
authentic Salzburg folk musik, wind players (Weisenbläser) and various choirs accompany the Advent market with festive music. Every Wednesday at 3 p.m. you can enjoy Stubenmusik in the Adventkaffee in the Orangery. A Christmas market with historic trick fountains – this is absolutely unique. The Baroque grottos and fountains have been known all over the world as 'summer sights'. Starting from Advent 2016 the area of the waterpark to the Sternweiher have been accessible during the opening hours of the Advent market. The path from the Fürstentisch to the Sternweiher, illuminated with a festive lighting, allows a very special wintery walk. Apart from the trick fountains the extensive, snowy palace park invite you to take a ride in a horse-drawn carriage. Every Saturday and Sunday you can get to know a completely different side of the park during this romantic tour. Tickets are available at the box office at the eastern gate. The Hellbrunn Palace Park is illuminated by a festive, enchanting light installation. In the middle of the water parterre, a special energy point as has been proven, the artist and event designer Markus Anders from Salzburg has built a Christmas angel with a total height of about 8 metres. The light beams and the natural wind ensure the dynamic appearence of the sculpture with its floating dress. Here you can see a video of the spectacular illumination of the Hellbrunn Christmas Angel! The Hellbrunn Advent Magic has become widely known especially for its comprehensive children's programme. There is a big petting zoo with sheeps, goats, donkeys, rabbits, chickens, geese, turkeys as well as lovely woolly pigs and minipigs. At the camp of the scout group Mülln the kids grill sausages over an open fire and the famous group "Die Kichererbsen" from Salzburg tell thrilling storys in their free puppet theatre (Kasperltheater). Baking cookies in the children's bakery, pony riding, taking a ride with the Christmas train, catching huge soap bubbles or allowing the magician Geraldo to cast a spell on you – all these things definitely make the time waiting for the Christ Child pass more quickly.